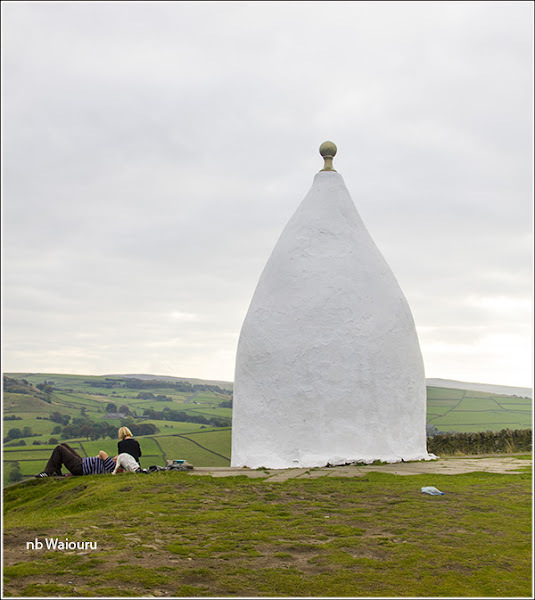 I learned about the ‘White Nancy’ when reading about Bollington last night. 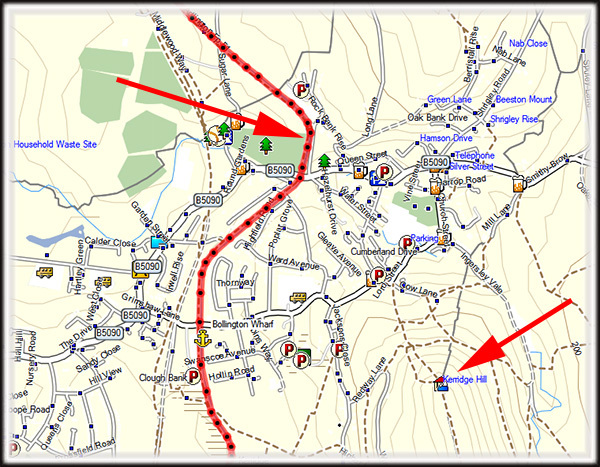 After loading the map on the laptop I identified it’s location and the shortest route. At just under 1.5km each way it looked like a quick walk before we departed. The shortest route up the hill happened to go straight up the face and gave me a good workout. 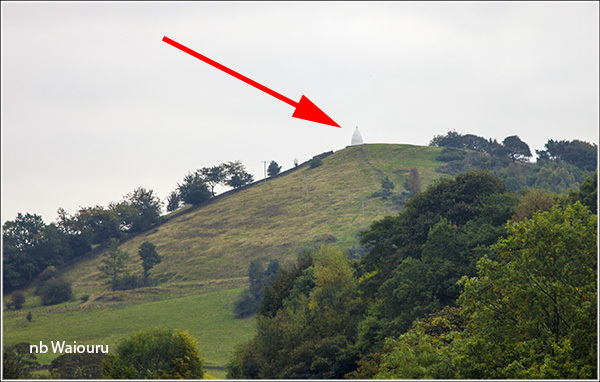 Wikipedia describes it as being the shape (profile) of the logo for the town of Bollington and was built on the orders of John Gaskell to commemorate Wellington’s victory over Napoleon at the Battle of Waterloo. The structure originally had an entrance which has now been blocked. The originals of the name are disputed with it possibly been named after Gaskell’s sister or the horse that pulled all the construction material to the site. It is constructed of sandstone rubble which has been rendered and painted. 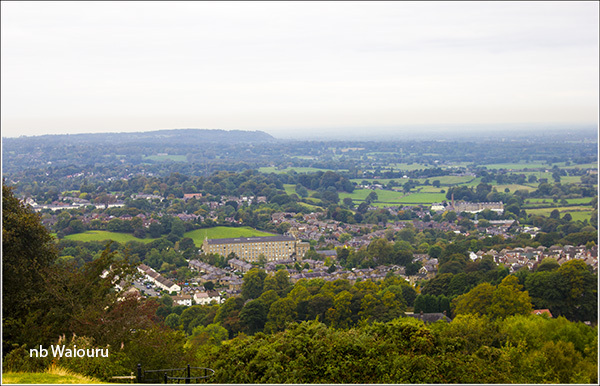 Weather permitting, there are good views from the top of the hill. 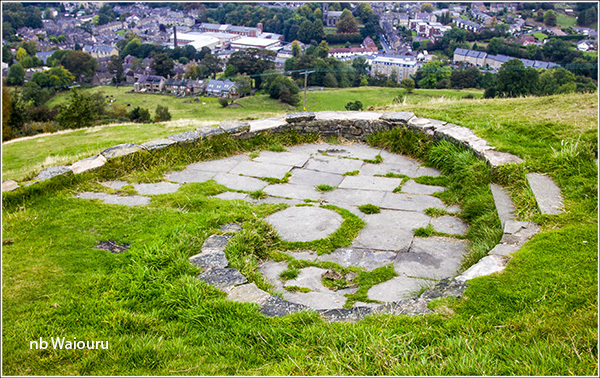 Beside the White Nancy is what appears to be a circular foundation. But I have no idea of its former purpose? 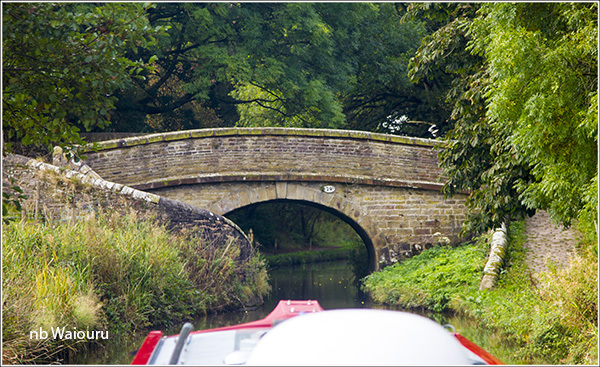 Jan managed to take a number of photos of one of the crossover bridges that can be found on the Macclesfield Canal. This design allowed the horse to cross from one side of the canal to the other without needing to remove the rope connecting it to the boat. We finished the day above Bosley Locks and after a light dinner I walked forward to inspect the flight. It was here in 2007 we were delayed a day whilst waiting for one of the locks to be repaired. I met a couple from Texas at lock 11 who were watching a single handed boater come up the flight. He had exited the lock and tied his boat before returning to close the top mitre gates. 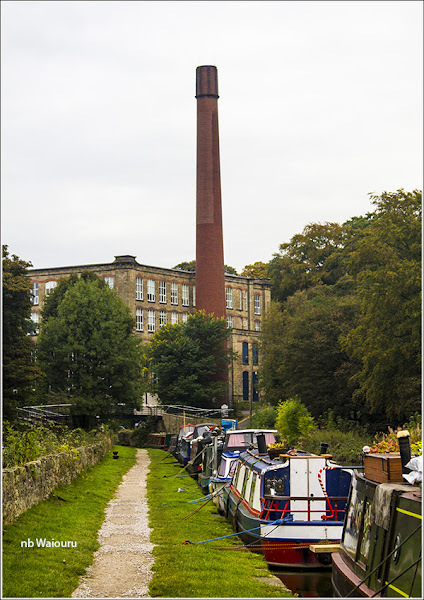 As he returned to the towpath side the far side gate swung back open. To my surprise he went to his boat and retrieved his boat pole. Looking at us he said “I’m a bit lazy, I should really walk back around to close the gate!” He then proceeded to reach across the full lock chamber with the pole and attempted to close the gate by pushing on the end of the gate beam with the pole. I told the Americans that this looked a very risky action as it would have been very easy for the end of the pole to slip off the gate beam. As he applied more force the gate started to move and instead of the pole being square on the the beam the angle became more acute. The end of the pole slipped off the beam and the boater lost his balance. Rather than falling into the lock he attempted to jump to the far side. Well he didn’t make it. His arms came down heavily and vertically on the coping stones whilst his chest hit them horizontally. He could easily have knocked himself out or winded himself on impact. He was floundering around in the lock and whilst watching him closely I suggested he make his way to the ladder. Fortunately he didn’t appear to be seriously hurt but I think he can forget about having a serviceable camera and phone. It was a poor decision for any boater to make, especially a solo boater! If he had wanted to close the far gate he would have done better to have used a boathook and pull the gate shut. Better still, spend an additional minute and walk back around the lock to close it. Oh dear - poor chap. But where's the photo? Well I hsd the camera but I was too concerned about involving myself in the rescue to remember to take a photo. Obviously I was never destined for a career in journalism! 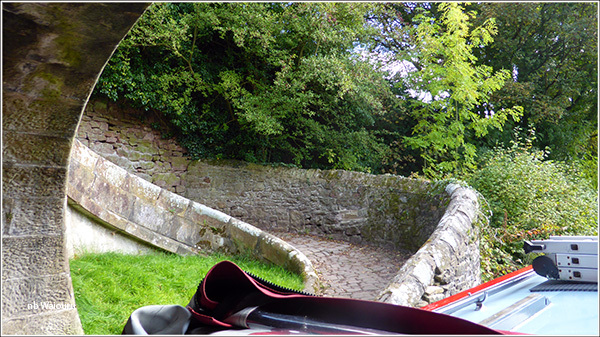 Hi Tom and Jan, I thought White Nancy was a lovely walk with our grandson - who skipped, jumped, ran up while I puffed and panted and stopped to look at the views ... Bosley locks look easy but like all of them, can be treacherous if not done carefully. Good thing you were there, I reckon! Today was our last day - now moored up at Barby and feeling sad, reflective and happy - excited we'll be back in 7 months! 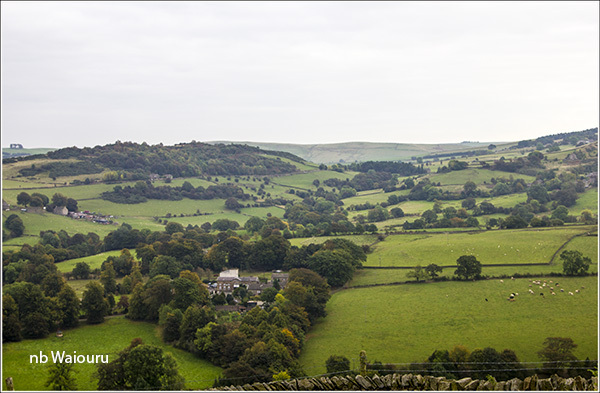 And here was me thinking we would meet when you headed back towards Whaley Bridge. Still, Barby is isolate but cheap. We are currently heading to Rugby. Perhaps we will meet next year. Our plan is to cover the south. Hi Tom and Jan, We'll be onboard till Thursday evening doing maintenance and winterising stuff, then off to Scotland to see the grandsons, drive back to Surrey to see the aged aunts and then fly home on Tuesday. Barby is looking good and is a lovely place - very well situated we think, as well as cheap for breasted up winter moorings. The toffs who built White Nancy used to enjoy taking tea up there so they could look out across their lands and the poor ruddy servants had to carry all the paraphenalia for a Georgian tea party up and town that hill. It's a steep enough climb just carrying a Mars bar in your pocket. It's a wonder we didn't have a revolution! Ah, the good old days when the peasants knew their place. It was WW1 that was the beginning of the end.